Winegard YA-6260 broadband yagi. 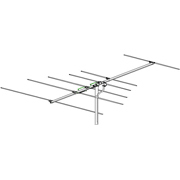 6 element Channel 2-6 TV antenna. Full size. Wide spread. Precision tuned elements. Completely factory preassembled with lock-tight reflector hardware and wrap-around mast clamp. Antenna is coated with high-quality polymer that prevents surface from oxidizing in any type of weather. Best to use when you are 40+ miles from transmitter.